skywalker66, the planet itself is there, just select HD 131399 A star and hit F2. The object searcher can't find it in some reason. Just out of curiosity, does anyone know the significance of the little dashes or minus signs that appear before some spectral classes in the Star browser? They are usually before the class G or hotter stars. I've researched and haven't stumbled on a connection to anything. I've noticed me too that sometimes some objects in star browser, which have a name longer than the available space in columns like in the image you posted, show a residual image of the last printed character that partially prints over the boundary of the next column. In your case the dash is related to the name of the star, not the stellar class, but this residual image can be exchanged for a minus sign, which does not exist in stellar classification. This tiny visual bug can be better noticed some times, since it involves also numbers. Ah! Thank you. It never occurred to me that it is just a bleed over from the previous column, but now it's easy to see. Hello everyone. I'm new here. I apologize in advance if these questions have already been answered. 1. 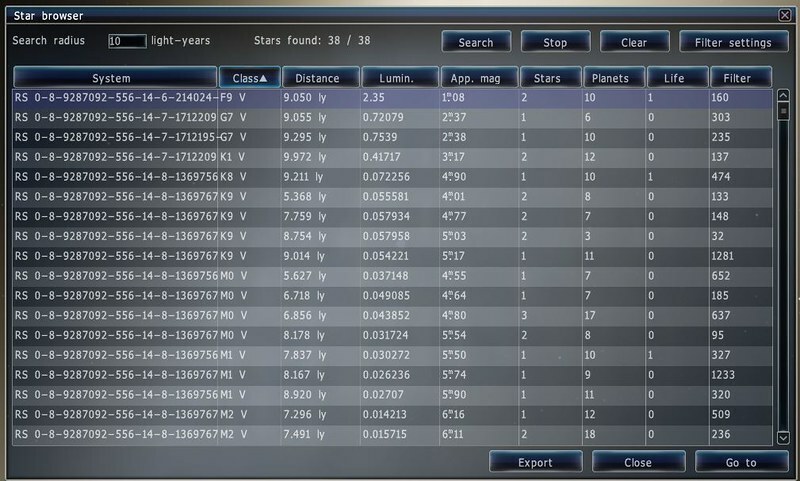 Is there any way to turn individual elements on/off(planets/stars/galaxies)? For example, I would like a skybox of the sky from earth that shows everything(including other planets, even if they are so small as to be hard to spot) so being able to turn off the Earth -only- would be ideal for me. Or being able to stop only certain galaxies from being shown. 3. Does anyone know which skybox faces need flipping/rotating(and in what manner) for use in Unity Engine? When I load the textures into the respective sides of a cubemap the result is that they don't match. As I read somewhere, unity engine has their cube faces all mixed up, but I can't for the life of me seem to get it right, so if anyone has gone through this before and knows, please tell me SOLVED! After some more fiddling and trying, I finally figured it out, have to switch negative Y and positive Y faces for Unity. I have noticed that in SE version 0.973 the aurora lights can be seen to move, change colors, or vanish continuously over the polar regions of Earth and other planets, but they did not do in SE version 0.980. How do you make the aurora lights move? Umm, they definitely do for me, wether I choose low quality auroras or high. Did you try by slightly accelerating time? You guys should really make this into an open source space physics and planet/astral body generator engine for game development. It's already much better than anything I've been able to find even in this state, minus the ground level planetary detail and bioms etc. but still the best on the big scale. This masterpiece is been developed by only one guy Vladimir Romanyuk. For now the open source possibility is not considered by the developer so it probably would remain like this, but the engine aspect for game developers is going to happen in theory. There will be a game developer release for Space Engine in the future. Mosfet, thank you very much for your inform...the aurora lights do move and change when I slightly accelerate time on garget slider below the screen. Is it possible to render a full 360 degree panorama movie in Space Engine like in this video? https://youtu.be/mK8CZW6jxy8 - I would like to use Space Engine 360 video as equatorial map or a cubemap for a background of a spaceship render in Blender. Can you point me in any direction how to achieve this? I know I can take 360 deg screenshots in cubemap mode but video don't work then. Open Display menu from the left menu bar, then choose "Cylindrical" from the Projection settings. YES!!! Thanks a lot Mosfet! I love this. Is it possible to set higher render resolution in cylindrical view? Higher than 2048. I don't care about FPS in this case. 1 would like output video to be 12k pixels across. 12k pixels across? How much vram do you have? I don't think. I tried forcing higher resolutions via config files, but SpaceEngine goes boom. I have 2gb vram. I have just made 3840x2160 video by forcing window mode and typing the resolution. So on my HD screen i can only see a quarter of a window (but that doesn't matter right now) but i can press F9 to begin recording and 4k video records fine. I have 3,5GB VRAM (GTX 970). I really only care about recording a view from low orbit - i can put a spacecraft into orbit and move away 30km so it's not visible. Then all i need is to force high enough resolution to make a good-looking 360 deg background for my 3d space station mode and press F9. 4k looks a lot better but 8k would be awesome. I will try 8k window with cylindrical rendering tomorrow. Ok, I can confirm that after setting window resolution to 8k (7680x4320) and keeping projection resolution as 2048 - It is possible to record an 8k movie - but AVI don't work - you need to use "move as screenshots" mode.